I'm ready to order Elements of Trust! Students follow a simple format for making a professional quality tie dye t-shirt in this step-by step Science Project. Using only the primary colors, students explore blends and secondary colors. This fun and colorful science project provides a meaningful hands-on experience that can be worn later in the week. Six different and easy to follow patterns help make the final outcomes more predictable. Using a simple tutorial step-by-step video, the process is easily managed and controlled. In addition, the accompanying tie dye set up video makes preparation a breeze. This fantastic science project adds fun, color and life to kick off you week of Science VBS! "Repent, then, and turn to God, so that your sins may be wiped out, that times of refreshing may come from the Lord"
"Changed in an Instant!" – You have never seen a chemical reaction quick like this. This Science Devotion is guaranteed to get gasps! An extremely powerful illustration visually captures a simple, rhyming concept: Though our sins are a big, black stain, God can make them clean again!" "Up, Up and Away!" 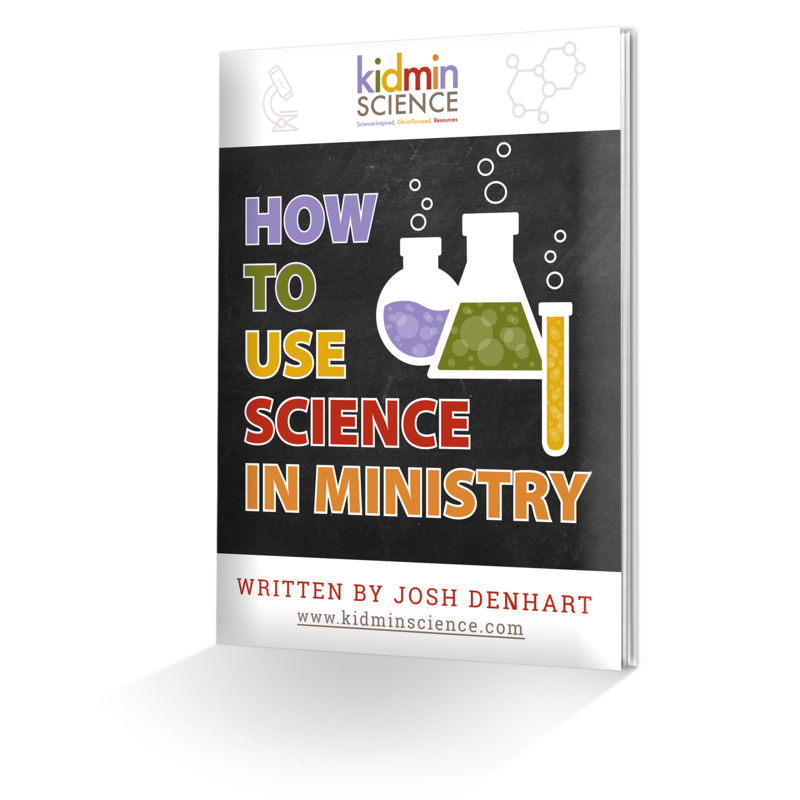 – This simple and yet profound Science Devotion make a powerful on the hearts of kids and leaders alike. You must realize, our prayers rise, up through the skies! Be prepared to have this illusive topic stick in the mind of al involved. This deeply personal devotion explores the truth found in 1st John 5:14-15 “This is the confidence we have in approaching God: that if we ask anything according to his will, he hears us. And if we know that he hears us—whatever we ask—we know that we have what we asked of him." Explore several new twists in this brand new slime activity. Explore combinations of polymers not previously encountered and mixtures of goo that will keep you guessing and engaged. This stuff drips, it drools, and drizzles right through your fingers and all over your hands! Kids try their hands as REAL scientists as they measure, pour, mix and discover their own unique variations of "Super Slime". These "Non-Newtonian Solids" are fun for all ages...including the leaders! Using simple and safe household substances, kids and leaders easily make an unforgettable science experience! Combine some common substances and explore how they respond in not so common ways! This project is a highlight of the week as little ones become BIG scientists by mixing, exploring and an experiment that THEY made! This highly engaging tactile exploration is easy for leaders and fun for kids. Kids love building real rockets! But watch out! This rocket project more than a blast…it’s a splash! Who wouldn't like to create their own custom rocket and launch in the air? Outside, students launch their handmade rockets into the sky! But you better bring your umbrella! Kids choose from different unique rocket designs. Rockets are crafted from printed color-card stock paper, complete with rocket fins and colorfully printed "flames" shooting from the base. Detailed instructions for launching apparatus provided. This hilarious pre-school science activity is a hit for all ages, but exceptionally special for the younger crowd. A straightforward rocket experience is nothing short of extraordinary for the hands and minds of pre-school kids. There is nothing better than the joyful anticipation of their turn, the squeals of elation as their rocket takes flight and the churning of little legs to chase the unpredictable and ingenious rocket! "All the believers were one in heart and mind. No one claimed that any of their possessions was their own, but they shared everything they had." "Don’t Be Greedy, People are Needy!" – This Science Devotion explores a compelling contrast between two substances with identical molecular structures. Though their structures are the same, yet they behave oh so differently. The fascinating dissimilarity in behavior sets up a wonderful spiritual discussion about those who are stingy and those who share! This Science Devotion explores Acts 4:32 and Acts 2:44-45. "Learning to share is beyond compare, so stop being greedy when others are needy!" "Don't Quench the Spirit" – Kids and leaders get a first row seat of a captivatingly visual Science Devotion. The unexpected transpires. The invisible affects the visible. A notable correlation drives home, "Don’t be rude with your attitude". This Science Devotion is highly memorable and a striking standout among all the devotions of the week. The lessons of this Science Devotion refer heavily upon 2nd Peter 1:20-21 & Acts 4:12. Students work as a team and construct a catapult from a very atypical set of resources. Students learn valuable life lessons about teamwork through planning, building and testing their catapult! Participants learn that in life we have limited time, limited resources and must work with other people different from us as they go back in time and become catapult builders for the middle ages! This hands-on experience is high on interaction and high on impact... literally! A closing competition puts their devices to the ultimate test – distance! This is a simple and fun and yet effective launching device that kids build…themselves! This fun and interactive experience uses household items to make a simple catapult able to launch marshmallows across the room! With the help of a leader a simple catapult is constructed... with their own hands! Students can also build a graphically rich castle from card-stock paper. "Peter and the other apostles replied: “We must obey God rather than human beings!" "Don't Get Bend Out of Shape!" – This Science Devotion explores an absolutely amazing property that will literally stop you in your tracks. This phenomenon completely defies reason and will make even the most astute sit up and take notice. This amazing demonstration creates fantastic illustration about God’s faithfulness through persecution. Acts 5:29 - Peter and the other apostles replied: "We must obey God rather than human beings!" "The Bed of Nails" – Kids and leaders get a first hand look (and touch) at an amazingly discrepant event that seems to defy conventional logic and reason. Using the scientific principles of surface area and pressure, this demonstration is a great way to show that an initial hypothesis is not always correct. This Science Devotion is a powerfully poignant reminder that in the abundance of trials, God's amazing power is shown strong. Students learn about the power of air and friction in this amazing hovercraft experience. Through building a simple contraption using household items, students are able to see their newly made machine effortlessly cruise across a smooth surface. Once the hovercraft is built, students can explore the properties over and over through testing, contests and more. This is where hands-on fun meets the simplicity of design for one winning hovercraft. This high energy pre-school science activity is a win for all ages, but particularly special for the younger crowd. A straightforward pneumatic experience of flight is nothing short of extraordinary for the hands and minds of pre-school kids. It's fun, it's easy and it is able to be created with their own hands. There is nothing better than the joyful squeals of elation as their contraption takes flight! Kids do real science as real scientists. Two age appropriate versions of every project make science fun for preschool and elementary students. Video tutorials make every project engaging for kids and a breeze for volunteers!